King County had an estimated population in 2017 of 2,189,000. By population, King is the largest county in Washington State, and the 12th largest in the United States. The county has a population comparable to that of the state of Nebraska, or the island of Manhattan. It has nearly twice the land area of the state of Rhode Island. 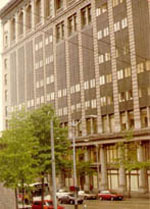 The county seat is Seattle, which is the state's largest city. About two-thirds of the county's population lives in the city's suburbs. King County ranks among the 100 highest-income counties in the United States. The county was formed out of territory within Thurston County on December 22, 1852, by the Oregon Territory legislature, and was named after Alabama resident William Rufus King, vice president under president Franklin Pierce. Seattle was made the county seat on January 11, 1853. King County originally extended to the Olympic Peninsula. According to historian Bill Speidel, when peninsular prohibitionists threatened to shut down Seattle's saloons, Doc Maynard engineered a peninsular independence movement; King County lost what is now Kitsap County, but preserved its entertainment industry. According to the U.S. Census Bureau, the county has a total area of 2,307 square miles. 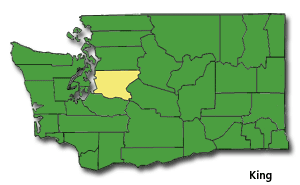 It is the 11th largest county in Washington by area. 2,126 square miles of it is land and 180 square miles of it is water. 7.82% of the total area is water. The population density is 816 per square mile.